We would like to draw your attention to the 29th annual Pakistan Workshop taking place at the Rook How, Lake District UK, 8-10 May 2015. The Pakistan Workshop was originally intended to bring together anthropologists and sociologists working on Pakistan, Pakistani diaspora and Islam in South Asia. However, we regularly receive work from a broad range of concepts and disciplines. With “Narrative, biography and autobiography” in the focus of the 2015 workshop, we hope to stimulate contributions from different disciplines and on different fields. With narratives, (hi)stories and (auto)biography in the focus of this year´s workshop, we hope to stimulate contributions from different disciplines and on different fields and are open for a whole range of approaches. Personal narratives and their analyses open up ways e.g. to scrutinize the intertwined processes of generating, shaping, constructing and challenging stories and history(s); examine the relationship between macro and micro processes; or explore oral story and history telling, as well as practices of silencing or mastering events and representations. The analysis of Pakistani life histories offers the opportunity to discuss individual life trajectories, decisions, and events as set against the social, economic and political spaces in which they are situated. Thus, on the one hand life histories reveal lived experience and on the other hand they enable to examine the relationship between structure and agency, between macro and micro processes, notions about perceived individual choice and agency, cultural logics, or predestination. A large part of Pakistani fiction writing today refers to the analysis of the impact of “high politics” on personal lives. Yet, this is a dual process: personal (hi)stories are always both embedded in, as well as affecting on politics, social rules, utopias and imaginations, boundaries and borders, as well as global flows and processes. For example autobiographic writings of politicians or retired state servants in Pakistan recently enjoy a big popularity. Their personal accounts add to a diversity of interpretations and analyses of recent Pakistani history and may be understood as support or challenges of the official “grand narrative” of the modern nation-state. Unconventional forms of academic writing, for example ethnographic novels or fictional biographies on the other hand experiment with data and composition. They take questions of genre, construction and representation, authority and authorship, poetics and politics to extremes. In this workshop we are interested in the “how” of writing personal (hi)stories on people and matters relating to a Pakistani context, as well as in the process of Pakistani history writing which is challenged as well as shaped by such writings. We invite reflections on conventional and unconventional forms of writing personal narratives, (auto)biographies and life histories and their impact on and in Pakistan. The Pakistan Workshop 2015 invites academics researching on Pakistan and the Pakistani diaspora to submit abstracts around ‘Narrative, biography and autobiography’. Nevertheless, this field as the theme for the workshop, is only a guide to encourage submissions around this area. You may submit abstract of your papers even if they do not coincide with this theme but would be of interest to those working on Pakistan. Deadline for abstracts is 28 February 2015. 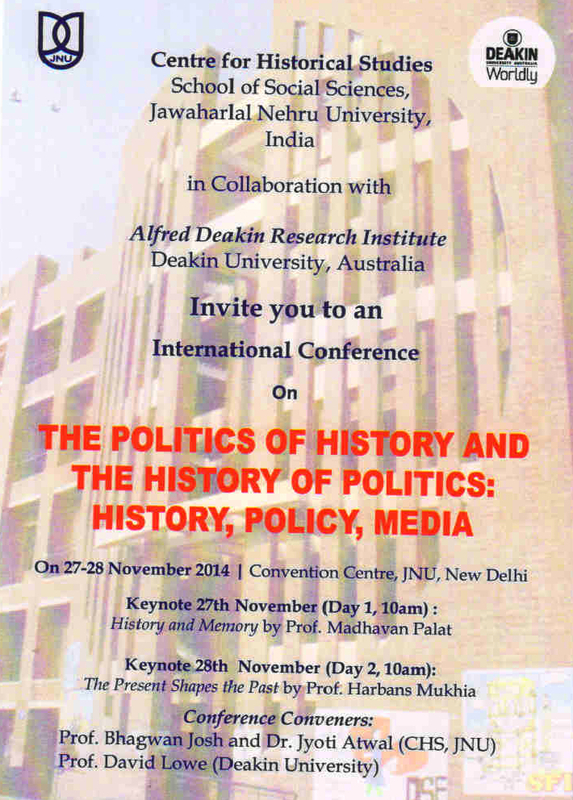 You are requested to send the abstracts to adsbindra@gmail.com or indrajeet69@gmail.com latest by 6th November, 2014.